A Liberal's Libretto: Sondra Radvanovsky's Verdi Arias: Sondra, you had me at "Pace". 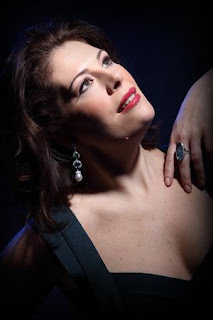 Sondra Radvanovsky's Verdi Arias: Sondra, you had me at "Pace". "I have known Sondra since her days in the Lindemann (Young Artist Development) Program at the Metropolitan Opera," said Opera Colorado guest conductor Stephen Lord. "Right from the outset, she showed a voice of uncommon quality, and she was always uniquely her own as an artist. I have been a fan and watched her grow since then." While I've not had the opportunity to hear her live, there are credible sources close to Yours Truly that tell me her Tosca at Opera Colorado was inexplicably out of this world. Having recently been given a copy of her solo debut CD Verdi Arias I can certainly understand all of the well deserved fuss surrounding Radvanovsky. Not so long ago a general director told me that a singer's calling card is the uniqueness of their voice... that unmistakable sound that some singers have. Think about it; Caballe, Sutherland, Horne, Callas, Dimitrova, Bumbry, Norman, Millo, Zajick ... they all have qualities, and some might say idiosyncrasies, that are so unique to *them*, that if you listen, you can instantly pick out who is who. In my opinion, based on what I've heard in this CD, Radvanovsky is most definitely in the realm of the unmistakable. Verdi Arias is a decent mix that can go up against any of the other Verdi aria CDs out there. And there are plenty out there to chose from. What sets Radvanovsky's apart are the qualities of her voice - warm, rich, and luscious without sacrificing the vibrato speed and depth that comes from a well placed instrument. In addition, the choices that she makes in regards to the music are unlike any that we've heard. "Tacea la notte" was simply sublime. But, "D'amor sull'ali rosee" left me wanting more from her chest voice. Not using it sometimes leaves certain key phrases in Verdi without the dramatic power the words call for - as in her treatment of "la mia difensa" ("in my defense"). It sounds like a pretty weak defense to me. But what she lacks in chest voice, she clearly makes up for in spin. When she comes to "i miei sospiri" ("my sighs"), her pianissimo turns left me sighing for certain. Now, while the selections from Un Ballo in Maschera and Il Corsaro show us that Radvanovsky has the vocal fortitude to go up against every twist, turn and tessitura challenge that Verdi offers his sopranos - it is "Pace, pace, mio Dio!" from La Forza del Destino that proves that Radvanovsky embodies La Forza del Verdi. While some sopranos try so hard to start the notoriously difficult aria in a pianissimo, extremely soft, manner - Radvanovsky, confident in her strong suits, allows each "Pace" to bloom first, then backs off in a way that made me instantly think: "Sondra ... girl ... you had me at 'Pace'". A choice in this aria that I found curiously odd though, was near the end when she sings "Misero pane, a prolungarmi vieni la sconsolata vita ..." ("Oh cursed bread, which prolongs this miserable existence"). Again, she used no chest voice. She chooses instead to sing these lines softly almost resolving herself to the existence rather than proclaiming it. -Hhmmm ... alright. I guess.- Then, slowly, articulately and almost metronomically she sings: "Ma chi giunge? Chi profanare ardisce il sacro loco?" ("But who comes now? Who dares profane this sacred place?"). I can't deal, Friends... I just can't. Not only is the word "Maledizione" one of the most incredible words in the Italian language, her treatment of it is ... well, it gave me goose bumps. Sondra, I'll buy whatever it is you're selling, kid. SOLD! Forza's "La vergine degli Angeli" is as angelic as a Verdi soprano can be and that's saying something. Given the instrument that a clearly authentic Verdi soprano possesses, 'angelic' is not always a word that is too often used to describe their singing. Only Verdi would make his soprano sing "Tutto sprezzo che d'Ernani non favella a questo core," ("I scorn everything that doesn't speak to the heart of Ernani,") while quickly moving the voice from bottom to top and top to bottom. But, Radvanovsky makes it sound easy-peasy. The end of "Ernani, involami" reminds me of early Callas recordings of the same aria. Not that she copied what Callas did, but rather in vocal quality; that dark, almost foggy sound with some shiny steel behind it. Aida is not a role that Radvanovsky has ever performed on stage and listening to her "O patria mia" makes me ask the question, "Uh... why?" I mean, I get all of the "it wasn't time" ... "the voice had to mature" ... yaddah yaddah. But, I'm not going to lie to you; "O patria mia" made me yearn for more. That's right. I said *yearn*. Imagine my delight when I read the following in the liner notes for the CD: "Plans to add ... the title role of Aida are about to be announced." Oh, yes. Bring it on, my dear. I want to hear you ritorna some-kinda vincitor. Wait. Did I just say that outloud? Yikes. Anyhoo, as not to spoil the entire CD, I'm going to leave the last two arias for you to listen to and analyze for yourself. I will say one thing, though - sister sure ends on a high note! Sondra Radvanovsky's Verdi Arias CD is a must-have for any opera lover who understands that truly authentic Verdi sopranos don't come along everyday ... Radvanovsky is as authentic as authentic gets. 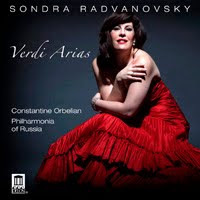 As a footnote: Sondra Radvanovsky Verdi Arias with Constantine Orbelian conducting the Philharmonia of Russia was released on the Delos label.